Prime Minister Narendra Modi, during his reply to the motion of thanks on the President’s address in the Lok Sabha on Thursday (February 07), had said new jobs were being created in the unorganised sector and that around 1.8 crore people had enrolled in the Employees’ Provident Fund (EPF) in the past 15 months, and out of which, 64 per cent, who were below the age of 28, were first-time employees. Citing the data under the National Pension Scheme (NPS), PM Modi also said that there has been an increase in the registration of employees from 65 lakh in March 2014 to 1.2 crore till October 2018. However, experts have termed the PM claims as incorrect. “When a person enrols for the EPF, it does not necessarily mean that the person has got a job. It is quite likely that you have enrolled for the the EPF for the first time though you had a job for a long time,” National Herald quoted Mahesh Vyas, Chief Executive Officer of Centre for Monitoring Indian Economy (CMIE), as saying. “The law requires an employer with 20 people or more to register with the EPFO. If a firm has got 19 employees till yesterday and today 20th person joins in, then all 20 get enrolled for the first time. So it looks like employment has gone up by 20 when actually it is one,” he added. PM said that with the sale of 36 lakh commercial vehicles and 27 lakh auto-rickshaws, he expected over 1.25 crore people to have got jobs in the transport sector. He also said that employment was created by setting up two lakh service call centres, infrastructure building, hotel constructions and housing activities. However, Vyas negated the same saying that if a farmer starts driving a truck or takes up a labourer’s job then it cannot be considered a new job. Modi had taken a jibe at the former governments for failing to built a standard system to tally employment and said that while only 7-8 sectors were taken into consideration while measuring the employment rate, in reality, jobs were created in 100-odd sectors. Vyas said that the PM was possibly referring to the enterprise survey conducted by the Labour Ministry. That is not the best way to estimate employment and unemployment in country like India. But what the Prime Minister did not mention was that India also conducted a large house-hold survey. It is the most appropriate way of computing it and will capture all sectors. He is partially right but selective in the kind of survey done,” National Herald quoted Vyas as saying. 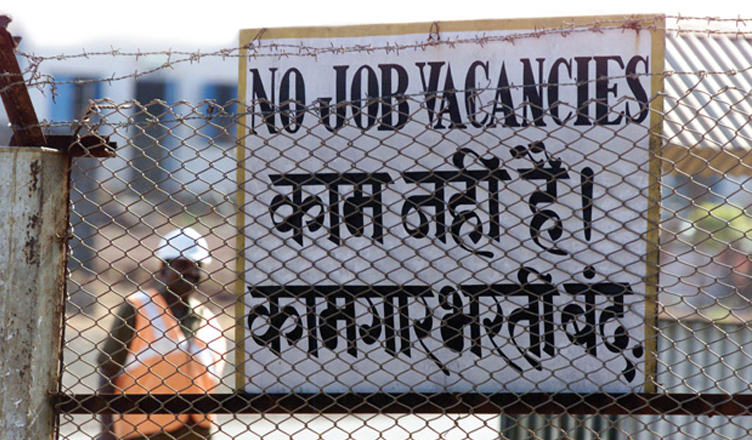 The National Sample Survey Organisation (NSSO) report, which has not been published yet, shows that the labour force participation rate (LFPR), part of the population working or looking out for jobs, has taken a sharp fall from 55.9% in 2011-12 to 49.8% in 2017-18.